For I long to see you, that I may share with you some spiritual gift so that you may be strengthened, that is, that you and I may be mutually encouraged by one another’s faith, yours and mine. Jesus Christ used to take the Twelve Apostles away to a lonely place to pray with them. He also would reveal to them the deeper meaning of the Scriptures and even revealed to some of them a special place or mission they had in His work. Since then, and all throughout the history of the Church, spiritual direction has had an important place in the Christian life. Here at St. Paul’s, we are dedicated to providing for anyone who wants it, good people to guide you in the spiritual life. If you want to be holy then you are ready to have a spiritual director. Below we have an excellent list of priests and religious to act as spiritual directors for any who request them. You can contact a director at your discretion and meet with them on your schedule. Your director will not speak for God, but will help you to better understand the Word of God and how God is speaking to you. Email om@uwcatholic.org to get connected with a spiritual director. But who can find such a friend? The Wise Man answers – “He that fears the Lord:” that is to say, the truly humble soul which earnestly desires to advance in the spiritual life. So, inasmuch as it concerns you so closely to set forth on this devout journey under good guidance, do you pray most earnestly to God to supply you with a guide after His Own Heart, and never doubt but that He will grant you one who is wise and faithful, even should He send you an angel from Heaven, as He sent to Tobias. Fr. 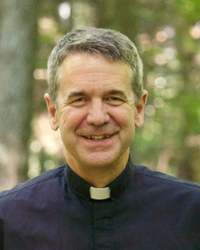 Eric Nielsen has been the Pastor of St. Paul’s since 2006 and a priest of the Diocese of Madison since 1995. The oldest of seven children, Fr. Nielsen grew up in Oshkosh, graduated in 1984 from the UW in Civil Engineering, and entered Mundelein Seminary in 1990. As a young man he enjoyed a lot of outdoor activity and travel but now spends most of his time at St. Paul’s encouraging students to focus on study and prayer as a path to know, love and serve Jesus Christ. Fr. Luke Syse also grew up in Blanchardville, WI and attended UW-Madison studying Biological Systems Engineering. He grew up in a Catholic home and thought about the priesthood at a young age. It was at St. Paul’s where Fr. 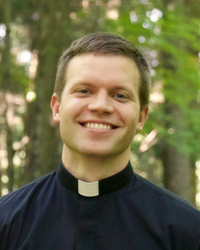 Luke discerned his vocation to the priesthood, entering seminary after graduation in 2011. After two years of seminary in Detroit and four years in Rome Fr. Luke returned home and was ordained to the priesthood on June 30th, 2017. He loves to play sports, especially basketball, and enjoys a good hike or bike ride in the great outdoors of Wisconsin. Fr. Andrew was born on the east side of Madison and began to grow in his faith while studying architecture at UW-Milwaukee. During a year of work and discernment after undergrad, Fr. Andrew frequented St. Paul’s and ultimately decided to enter the seminary. Fr. Andrew has spent the last 5 years in studying Rome and he was ordained a priest on June 30th, 2017. He enjoys hockey, lacrosse, drawing, art, and anything outdoors. Please email Fr. Andrew at ashowers@uwcatholic.org. Fr. Greg Ihm grew up in Lancaster, WI on a farm, attended seminary in Rome, and was ordained in 2010. He is currently the vocation director for the Diocese of Madison and the Bishop’s Master of Ceremonies. He will be celebrating Mass on most Tuesdays at 5 pm.